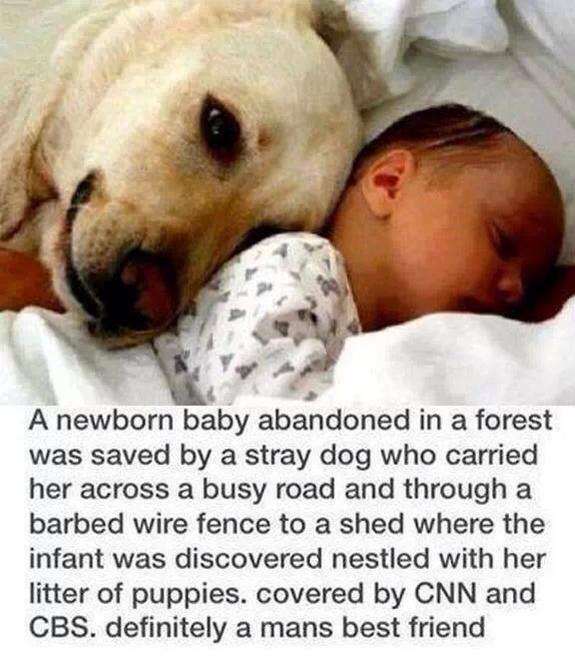 FACT CHECK: Does a photograph show a dog who saved the life of an abandoned newborn child? 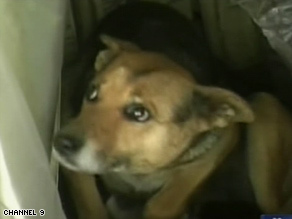 Claim: Photograph shows a dog who saved the life of an abandoned newborn child. WHAT’S TRUE: Various international news accounts published between 2005 and 2013 have reported dogs rescuing abandoned newborn babies. WHAT’S FALSE: The photograph shown above is connected to any of those news reports. I saw this ridiculous report on my news feed on Facebook. How did they know the dog carried her across a busy road if they had first discovered the infant in the shed? Who would stand there and wait for dog to get the baby to the shed? Although both iterations of this meme amassed hundreds of thousands of shares each, the claim associated with the images of a dog and a sleeping newborn was not new, was of uncertain validity, and did not originate in the U.S. The popular image associated with the circulated meme is a stock photograph which is completely unrelated to any news story and does not depict a hero dog and a baby rescued by it. A nursing dog foraging for food retrieved an abandoned baby girl in a forest in Kenya and carried the infant to its litter of puppies, witnesses said. 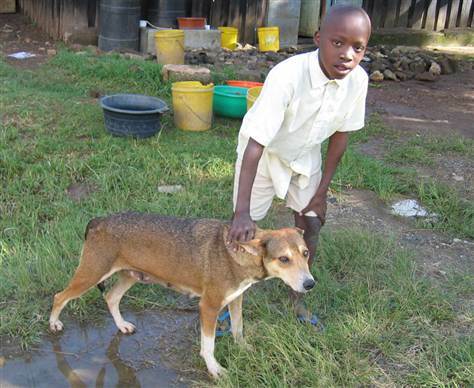 The stray dog carried the infant across a busy road and through a barbed wire fence in a poor neighborhood near the Ngong Forest in the capital, Nairobi, Stephen Thoya told the independent Daily Nation newspaper. The dog apparently found the baby in the plastic bag in which the infant had been abandoned, said Aggrey Mwalimu, owner of the compound where the animal is now living. It was unclear how the baby survived in the bag without suffocating. A dog sheltered a newborn baby abandoned by its 14-year-old mother in a field in rural Argentina until the boy was rescued, a doctor said. A resident of a rural area outside La Plata called police to say that he had heard the baby crying in a field behind his house. The man went outside and found the infant lying beside the dog and its six newborn puppies, said Daniel Salcedo, chief of police of the Province of Buenos Aires. The dog had apparently carried the baby 50 meters from where his mother had abandoned him to where the puppies were huddled, police said. A farm dog in Ghana has attained hero status after spending a night protecting an abandoned newborn human. Authorities say the dog, along with its two-week-old charge, was found under a bridge in Winkongo (which is near Bolgatanga, the Upper East Regional Capital of Ghana), near the farm where he lives — with the tiny baby snuggled against him. A search party had been convened to look for the dog, not the baby, when the pooch’s worried owner got concerned that her pet hadn’t returned home in the evening. Searchers spent most of the night tracking the hound through nearby fields and woods, and came upon the unlikely pair quite some time later; finally locating him under the bridge near the farm he calls home, they were surprised to find the dog curled around a human infant. A newborn baby, abandoned inside a plastic carrier bag and hidden in bushes, was sniffed out by a friendly Alsatian roaming parkland. Inquisitive pet Jade alerted her owner by scampering excitedly around undergrowth in a far corner of Stechford’s Marlborough House Community Park. And when he went to inspect, the stunned walker discovered the six-pound baby girl, swathed in blue toweling and concealed in a toy shop bag. She is thought to be only a day old and her umbilical cord was still attached.